LAS VEGAS, NV — At CES 2018, ADATA demonstrated its new high-end XPG SX8200 SSDs. The new drives use Silicon Motion’s SM2262 controller as well as 3D TLC NAND. The SSDs will be available in configurations featuring up to 2 TB of raw 3D TLC NAND memory and promise to offer up to 3.2 GB/s sequential read speed. Silicon Motion quietly introduced its latest-generation controllers at Computex 2017, with multiple vendors showing off SSDs powered by the SM2262 and SM2263XT controllers. Back then some promised that a new breed of SMI-based drives was just around the corner and the products would ship in 2017. As it happens sometimes, final stages of development took a bit longer than expected and we are going to see a host of new SSDs in 2018. At least on paper, SM2262-based SSDs look very fast. In addition, improved performance of the controller (vs. predecessors) enables developers of drives to use sophisticated LDPC ECC algorithms, enhancing endurance of SSDs that use 3D TLC memory. 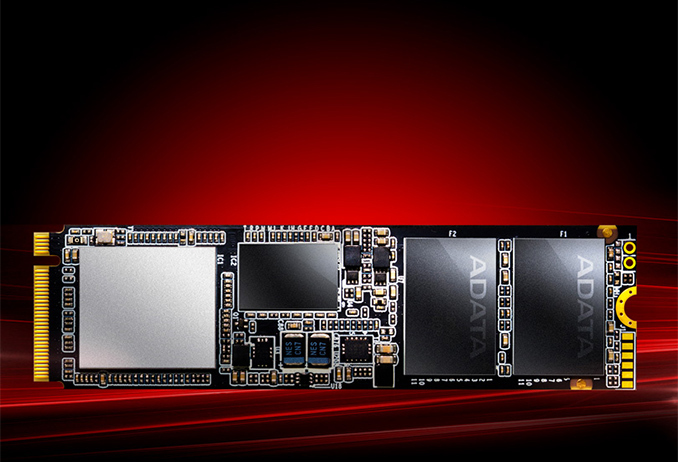 ADATA will likely be among the first companies to ship SM2262-based drives with the XPG SX8200 being their first offering featuring the controller. The XPG SX8200 will be available in 240 GB, 480 GB, 960 GB as well as 1.92 GB configurations and will thus be able to address users with vastly different capacity needs. ADATA’s current-generation consumer M.2 drives offer capacities up to 1 TB, leaving the highest end of the market to companies like Samsung. With the XPG SX8200, ADATA is announcing a 1.92 TB version that will inevitably compete against Samsung’s top-of-the-line 960 Pro SSD for end-users who need a lot of non-volatile storage space. As for performance of the XPG SX8200, ADATA is sharing official figures from Silicon Motion: up to 3.2 GB/s sequential read speed and up to 1.7 GB/s sequential write speed. The manufacturer does not publish random performance numbers, but Silicon Motion expects SM2262-based drives to hit up to 370K/300K random read/write 4K IOPS. Both Silicon Motion and ADATA cite peak numbers and real-world performance of the drives will be different. ADATA plans to start selling the XPG SX8200 sometime in February, starting with the lower capacities. The company did not announce anything concerning its offerings based on a more powerful SM2262EN controller at CES. Meanwhile, the fact that it assigned the SM2262-based SSDs to the XPG SX8200-series indicates that the XPG 9200-series (offering even higher performance) is a spare number in the stack and will be used when the time is right. So what is the expected real life endurance compared to it predecessor XPG-SX8000 with 3D MLC NAND?